A little girl has become a viral internet sensation after schooling an icky grown-up about diversity. 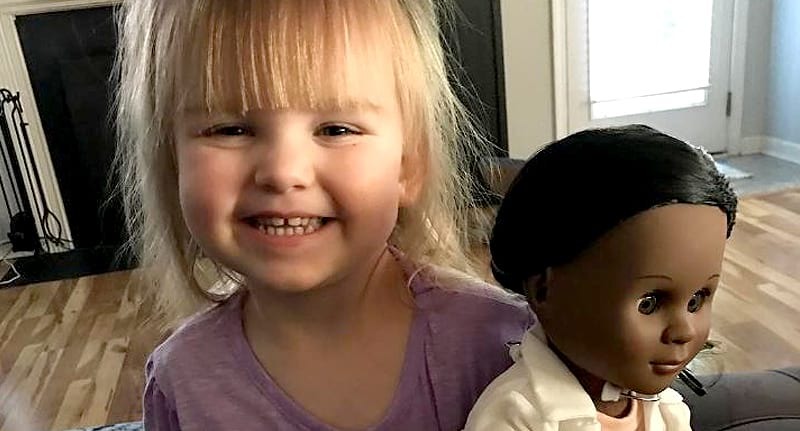 Sophia, a two-year-old from South Carolina, was asked to reconsider her choice of doll in a Target store by a member of staff. ‘Why?’ I hear you ask. Because of the difference in their skin colour. When Sophia got to pick a present from the toy store for reaching the pinnacle of potty-trained expertise, the little girl picked a doctor doll to quench her obsession with becoming a doctor herself. But that wasn’t good enough for the adult at Target, to whom Sophia sweetly explained tolerance and anti-racist sentiments in that perfectly simple way only children know how. Sophia’s mum, Brandi Brenner was so proud of her daughter’s display of love, she shared the story on Instagram. While we were checking out, the cashier asked Sophia if she was going to a birthday party. We both gave her a blank stare. She then pointed to the doll and asked Sophia if she picked her out for a friend. This experience just confirmed my belief that we aren’t born with the idea that colour matters. Skin comes in different colours just like hair and eyes and every shade is beautiful. Yet again, a bright young spark has proven what most of us already know – people aren’t born racist and we can teach people to unlearn their unsavoury points of view.